An Actor Prepares… – CPA Theatricals, Inc.
An Actor Prepares – by Stanislavski. Who’s he? Why do I need to read this? But as I got into the book, I thought it was fascinating. It was kind of like a diary, as I recall. It portrayed a student in an acting class. It talked about how an actor prepares for and creates a character. I was to learn that creating characters is really what interests me. Both when I was acting and now that I am writing stories and characters. I found this picture on the internet and I thought it was so fascinating. Here, Betty Buckley is seen in her dressing room, waiting to go on in Act 2 of HELLO DOLLY. She is in full costume, makeup, even headdress. 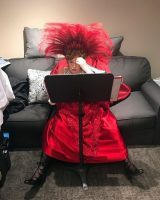 Even though she has been touring with the show for quite a while, she is checking her notes, in the script between the act breaks. Amazing. Betty Buckley has had a long, distinguished career. Grizabella, Norma Desmond and Carrie’s mother in CARRIE are just some of the roles she has portrayed on Broadway. I saw her in the latter two. You can also recognize her voice in the movie HAIR and of course the TV series Eight is Enough. So, what’s someone with her experience doing checking the script between acts of a long running musical? She is preparing. She is recalling. She is reminding herself of her notes. Ahhhhh what a pro. I once had an acting teacher say to me that when she is performing she read the play EVERY night before she went to bed. Why? She wanted to thoroughly understand the play, try and mine the playwright’s intentions and mostly she wanted to understand her character and the motivations behind the actions.